Oops - we don't appear to have a video for the Documate 250. The Xerox DocuMate 250 Scanner is a compact and effective hi-speed scanner perfect for workgroups and other decentralized scanning applications. Xerox offers this model at a price that enables businesses to achieve high levels of productivity by distributing fast cost-effective scanners throughout the organization. 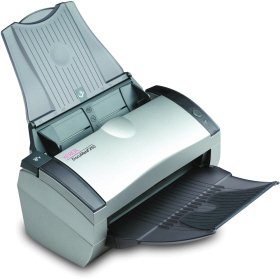 The DocuMate 250 has a 50-page+ Automatic Document Feeder that scans 22 pages per minute (22* ppm). It features 600x1200 dpi optical resolution, 48-bit color, Hi-Speed USB 2.0 interface and scans everything from checks and photos up to legal-sized documents. It also features one of the smallest footprints available of any ADF scanner on the market.